Save 40% NOW on St Louis' Best and Scariest Haunted Houses. Grab Your friends NOW and Scream Together. 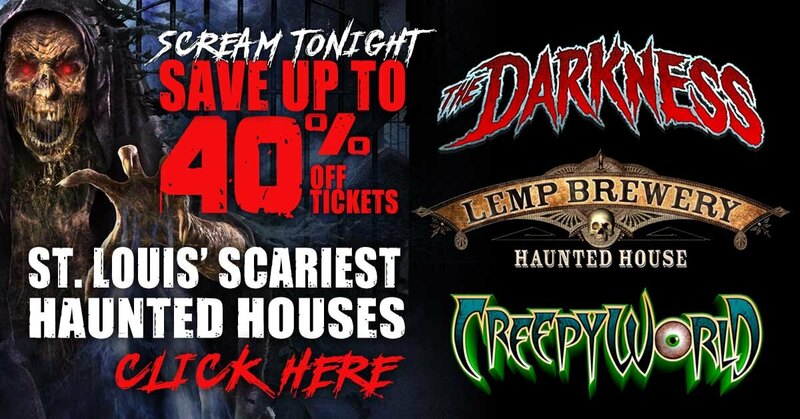 Visit The Darkness - Creepyworld - Lemp Haunted House with an Ultimate Scream Pass and Save 40%. You can visit all three haunted houses in the same night or different nights now thru November 3rd, 2018. The Darkness - Lemp Haunted House - Creepyworld PLUS Speed Pasess - The Hive Zombie Experience and Trick R Treat Haunted Hayride - Multiple Outdoor Scream Zones and More! Additionally attractions at Darkness are St Louis Escape Rooms located next door to Darkness www.StLouisEscape.com or the 3 Minute Horror Escape located at the Exit of Darkness. Creepyworld also features a zombie paintball, 5 minute horror escape room, and horror themed carnival games.